We visited this park on January 31, 2017, and stayed for 1 day(s). The El Paso West – Anthony KOA is one of two overnight stopovers between Tucson, Arizona and San Antonio, Texas. It’s nothing fancy, but so convenient and welcoming. If you’re a VKR member, the cost is $36/night. Pull-through sites are gravel, long and sufficiently wide, and have 50 AMP full-hookups plus cable and free wi-fi. Since we had been traveling non-stop for awhile and pulled into our site early enough, I immediately began to catch up on laundry chores. Their laundry room is small, but nice, with four large top-load washers and another four dryers. 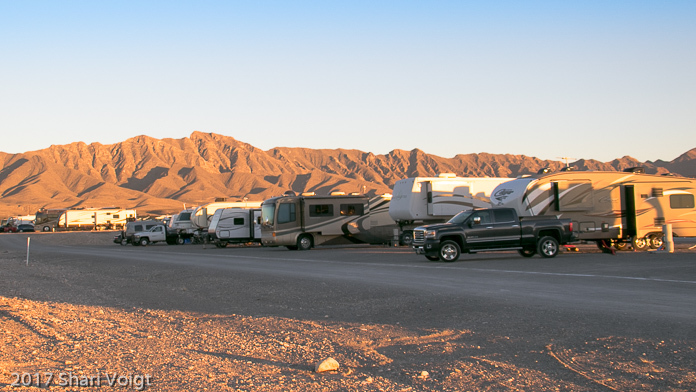 Although the El Paso West – Anthony KOA is basically a well-equipped gravel parking lot, the views are outstanding. It sits behind a Camping World, which is convenient if you’re in need of any camp gear or parts.